Today, ParentalRights.Org released an online docudrama, Overruled: Government Invasion of Your Parental Rights, which outlines today’s dangers facing American parents in their ability to direct the upbringing and education of their children. The film, which runs 35 minutes at OverruledMovie.com, focuses on three real-life American family cases in which parental rights were egregiously violated by the government: a medical care case, an educational freedom case, and a religious freedom case. The movie also warns against adoption of the United Nations’ Convention on the Rights of the Child. 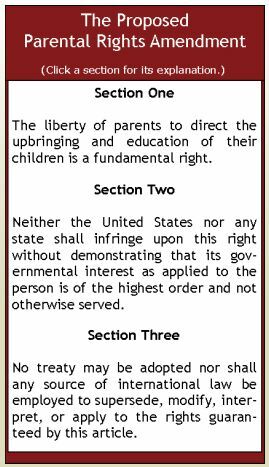 This treaty would override virtually all child and family laws in the United States and grant ultimate authority to international bureaucrats. 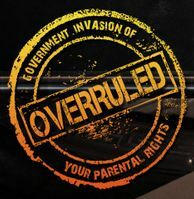 Overruled describes why the adoption of the proposed Parental Rights Amendment to the U.S. Constitution is the only means to halt the parental rights violations which are taking place all over America. Fortunately, the American people overwhelmingly support traditional parental rights. A Zogby poll last year that surveyed over 2,000 people found that 93% of Americans agree with the traditional definition of parental rights, which is the ability to raise their children free from government interference so long as no abuse or neglect is taking place. Farris said, “We need to capitalize on this strong support all across the country and pass the Parental Rights Amendment to prevent government officials from unnecessarily interfering with families.” Scott Scharpen, the film’s Executive Producer and chairman of the board of ParentalRights.Org, was proud to announce that Overruled is presented by ParentalRights.Org, a non-profit grassroots organization focused on passing the Parental Rights Amendment. Overruled is available online free of charge at OverruledMovie.com. For more information, visit www.ParentalRights.Org. Protect our children! Sign the Parental Rights Petition.